My Rants and personal Writings. 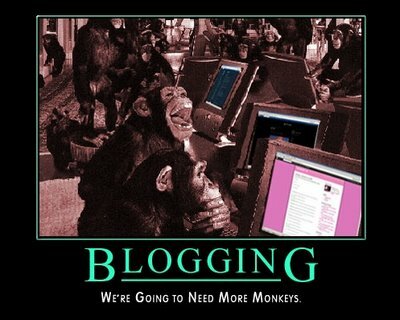 Posted on November 8, 2007 by Digital Sensei CommentsNo Comments on A day in the life of a Deviant blogging hacker. A day in the life of a Deviant blogging hacker. Ever felt you had an addiction to the internet?!? No, well good same here. Though what happened today would be proof that I was addicted. So, we where downtown running some errants and the moment they where finished and we got close to the nearest coffee house I have an online account with I hopped out quickly and made a mad dash to get online. Well it was worth it. I had two new pictures to post and a lot to do and learn. Plus on top of it all all I’m ecstatic, at last count I have 1450 views of my art work. (^.^) thanks everyone, I’m glad to see you like my work so much. Keep it up and I’ll make sure you guys always have something new there to see. So, some of the thing I’ve learned was how to use twitter for promoting a blog and how to do more interesting blog entries. Yes, I’m working on this thing to make sure there’s better content for your reading pleasure. As well as found some new viral marketing tips and I’m going to try them out. For some news, Comcast has violated the Net Neutrality, go read the post on digg, slashdot, CNet and ZDnet and on netneutrality.org. On top of it all, I’ll be volunteering with the salvation army again this year for the third year running. So this means even more of a challenge to me to post regularly. Though that’s still the challenge isn’t it. (^.-) No worries though, you’ll still be able to see all the new pretty artwork at lease every week. And I’ll try to have a tutorial ready for you every week. I do still plan on doing a screencast and the podcast for you guys.